You can find my gluten-free baked goods at my favorite Austin coffee shop, Cenote Cafe, 1010 E. Cesar Chavez, Austin, Texas. 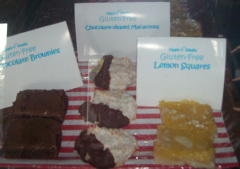 Though I am no longer there baking myself, most of the gluten free offerings are my recipes. I realize that many people still think that gluten-free diets are nothing but a passing fad, but I assure you that if you know anyone who gets hives or throws up when they eat gluten, you would know that it's quite the opposite. Sometimes it's not immediately obvious, and clearly most doctors are not trained to look for gluten allergies, so many people go for years and years feeling awful and not knowing why. In our family, the hives (and the GERD) were actually a bit of blessing because it led us to the culprit, and the problem was resolved. It could have turned out much differently. I should note that people who have such reactions are the lucky ones. If you research this topic, it becomes clear that gluten intolerance is ultimately responsible for a myriad of health problems that would seem completely unrelated. The fact is that if your gut integrity is challenged, toxins of all sorts (including the indigestible wheat proteins) can permeate your gut, enter the bloodstream, and find their way to your most vulnerable organs. Heart disease, arthritis, brain disorders (including schizophrenia, ADHD and depression), diabetes, multiple sclerosis ... are but a few of the maladies that are helped by removing gluten from the diet. Green Med Info has hundreds of published studies on their site proving the link between gluten and these diseases. When our family became aware that gluten was the cause of so much of our suffering, I had to adapt by eliminating wheat flour from my kitchen completely. It's become clear to me now that if one family member has a gluten allergy, other blood relatives are likely to have a sensitivity at the very least. ALL of us are much healthier for having made the change. Before I dive into specifics about flour mixes and baking, I want to make one thing VERY clear. All grains cause their own challenges. If you are suffering with something very serious such as cancer or a neurological disorder, it's imperative you go cold turkey and get off all grains as soon as possible. (Research Dr. Peter Osborne for more on this.) The flour mixes that I share below as well as pretty much all the commercially available, pre-packaged gluten-free flour mixes, use alternatives that are high on the glycemic index, in most cases higher than wheat. Though the offending gluten proteins are (thankfully) missing from these mixes, if you have diabetes or blood sugar problems, you should also avoid all grains until your blood sugar returns to normal. Grains turn to sugar in the gut. The good news is that many diabetics have completely reversed their diagnosis on a grain-free diet. The bad news is that none of us can ever safely return to a wheat-based diet no matter how much we miss those breakfast croissants. For most of us, removing gluten from the diet is a process. If you're not facing a life-threatening illness, the flour mixes and suggestions below are just the ticket to help with the transition. Because, yes, it's easier to get to NO WHEAT by substituting these alternative flour mixes for the toxic wheat-based goodies until your taste buds - and your body - starts changing. And believe me, they will. *a note about xanthan gum: it's a binder made from a mold traditionally found in corn. It helps your alternative flours stick together during the baking process. Though xanthan gum has gotten a bad rap in some circles, recent studies have shown it to be safe. Please see Chris Kresser's article on the safety of xanthan gum here. Mix up a bunch of this at a time and keep it in a gallon jar on the counter ... so it's easy to simply reach for it whenever you're making something that requires flour. Substitute measure-for-measure and use it as you would regular wheat flour. I do NOT put the xanthan gum in the mix itself (though you could if you want) but rather add it to each recipe as needed. I find that I have a better chance of getting each baking project to stick together better if I add it in when putting the recipe together. "Sweet rice" flour is another type of flour different than white or brown which naturally has a bit of 'stickiness' to it. If you use this one in lieu of one of the other rice flours, use a bit less of it (~3/4 cup instead of 1 cup). For frying (as in fried chicken), I add about 1/4 - 1/3 cup of garbanzo bean (chickpea) flour to each cup of the above mix. Or of course, you can try garbanzo flour all by itself, but it has a very distinctive bean flavor that some people don't like. I dip the chicken pieces (or green tomatoes or whatever else you want to fry) into the flour mix, then into a bowl with a whisked egg, then back into the flour before putting into the pan of hot oil. Bob's Red Mill sells a garbanzo-fava bean flour mix that works well for this. Add in that quarter to one-third cup to each cup of the regular gluten-free mix. The more bean flour, the crispier it will be, but do remember to test-taste as you may not like the bean flavor. Better yet, use arrowroot starch instead of a flour, mixing a tablespoon of starch with 1 tablespoon of your pan liquid before adding it to the full pan. Another possibility is kudzu root, which looks and acts like arrowroot but has a more distinctive "look" to it. I always use kudzu with chinese stir fries, adding a little gluten-free tamari to the dish as well. It gives the dish a bit of a sheen and thickens quickly (so use it near the very end of cooking). Though I used to use an elaborate tapioca flour, I now prefer a more paleo pizza using Jane Barthelemy's flat bread recipe. (If you haven't discovered Jane yet, you're in for a real treat. Check out her website.) You can literally spoon this onto parchment paper into any shape you want. Bake and add your favorite pizza topping. The following is for a personal size (i.e., small) pizza; I don't recommend doubling it to make it larger as it doesn't cook through as well. Beware this is quite different than traditional pizza crust. Mix all ingredients together until all lumps are gone, then pour onto parchment paper into desired shape using the back of a spoon to spread the batter. Bake at 425 for 5 min. Remove from oven, and carefully pull of the parchment paper and turn over your crust. Put it back down on the parchment paper and bake another 4 minutes on the other side. Let cool completely before adding toppings so the "crust" will stay firm under the weight of tomato sauce and/or a lot of toppings. Bake approx 12-15 minutes at around 350 to heat your toppings all the way through. Add 3 T. ice-cold water or alt milk and mix with your hands. Form a ball and roll out on a board covered with the flour mixture to keep it from sticking. You may have to add more cold liquid OR more flour mix to get good rolling consistency, but with a little practice this makes the perfect gluten-free pie crust. I guarantee nobody will know the difference. If you're already into eating gluten-free, you probably know that there is a huge new industry built up around just gluten-free bread baking. Several companies have dedicated gluten-free bread machines these days, and a few of them have won rave reviews. If you're going to go this route, I recommend Annalise Roberts' book Gluten-Free Baking Classics for the Bread Machine. (I don't do g-f breads often enough to be of much help here, but her books are well presented and her other recipes have proven to be excellent. My personal favorite store-bought gluten-free bread is by Northern Bakehouse. Excellent texture!